Rekkae saison is a rustic saison that I’ve brewed a few times before. I’ve swapped in rye and oats, honey and sugar portions to tune the flavors and see how they work. I’ve also played with several different yeast strains from the classic DuPont to the fast and furious 3711. This time I threw in more rye and orange blossom honey, two of my favorites and used my mixed culture yeast to see how that would affect the recipe. 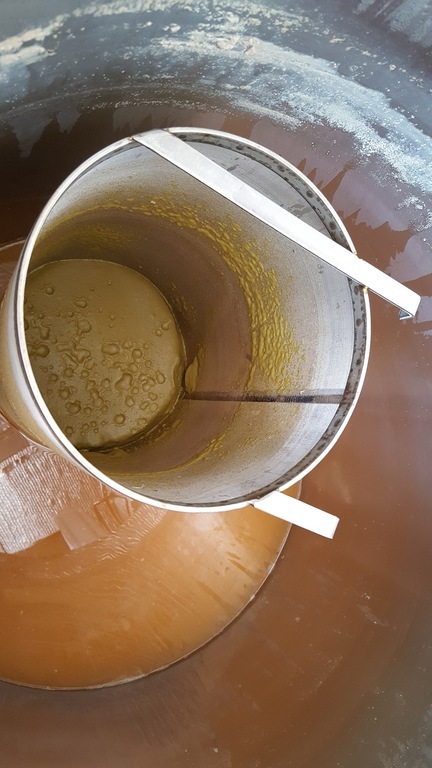 My previous experience with the mixed culture indicated that the fermentation would go very quickly, usually terminal gravity within two to three days. I wanted to see just how quickly it could work for this saison and what sorts of flavors would be present with such a fast fermentation. This recipe went from grain to glass in 12 days which is remarkable. 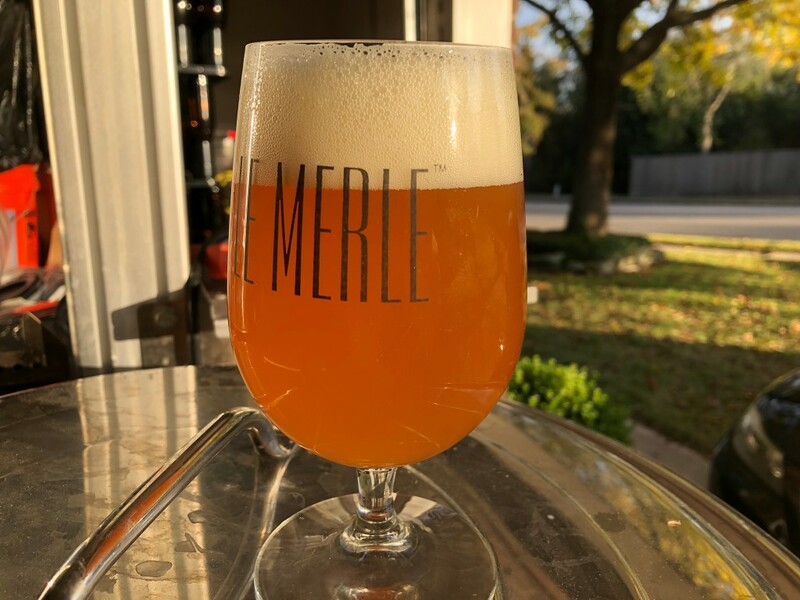 It turned out a saison with classic flavors: sweet malts, spicy and peppery yeast with the Rye coming through and then the honey shining through with a nice crisp finish leaving a want for another round. Honey, sweet malts, light bubblegum, banana and a light citrus, mostly from the Orange Blossom honey. Golden hue with some slight haze. Somewhere between orange and deep yellow. Thick foamy head which lingers with lacing on the glass and fades into the beer over time. Citrus fruits with a sweet malt background, spiciness from the rye. A light candiness floats on top and as the finish arrives it fades away to a dry, bitter, peppery finish. Medium to full but not so heavy as to deny additional pints. It could be fuller, or lighter which likely means that it’s just right. This is really easy to drink as it has a complex array of flavors but with several pleasant ones dominating, the spice and honey. I would bump the peppercorns up again as I really like what they bring but I want more bite to the flavor. The last brew was well on its way to being _the_ one. A flawless brew day, no hiccups during fermentation. 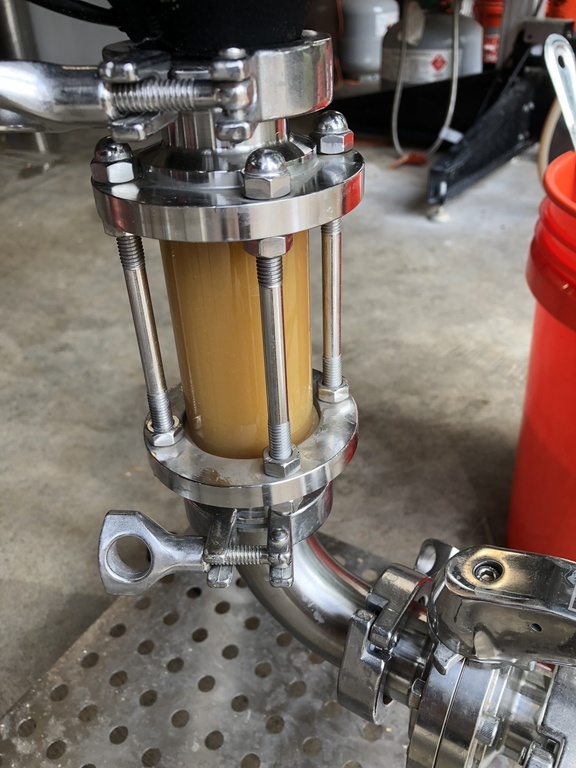 I even used a forced diacetyl test and ended up raising the temp a few days during the last dry-hop (no thanks to hop creep) to clean things up. 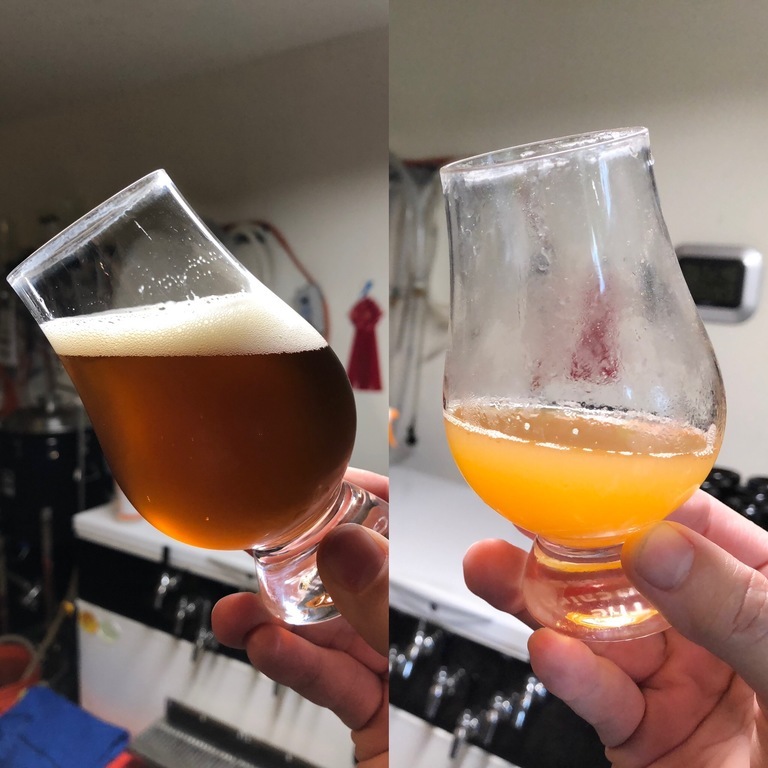 Right side is sample from conical; Left side is two days in the keg. What a huge letdown. But I’ve seen this before. Oxidation. But from where. 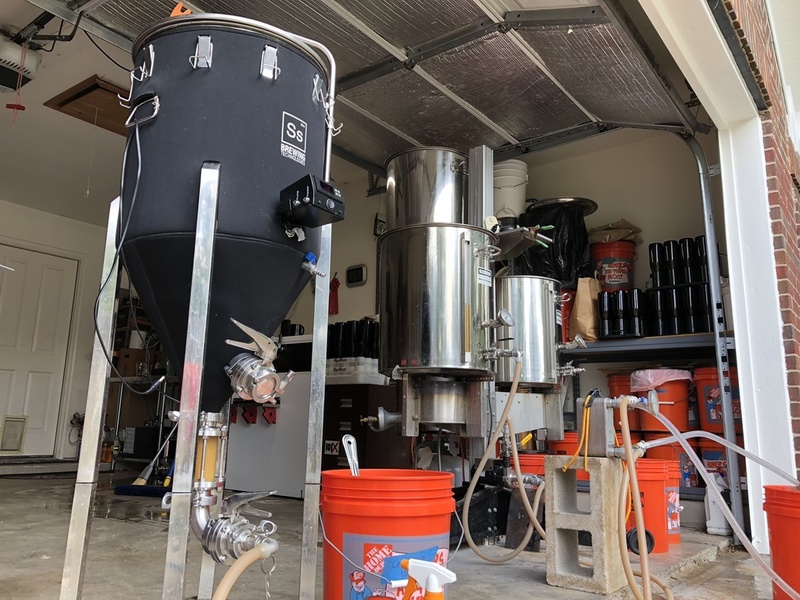 I’ve brewed about 12 batches of beer with this equipment and I’ve only used the hop strainer (extra large one) on exactly two batches of Nor’Easter. The previous one turned color which I assumed was related to the infection I found in my pump but with that now hyper cleansed the only remaining element is the strainer. I also brewed a pilsner which turned out fantastic and it’s still pale as straw on the tap today. What difference? No dry-hop which mean no use of the strainer. This is super frustrating, not to mention costly; hops for NEIPAs aren’t cheap. I did the only thing I could do: brew another batch and remove the fatal flaw. 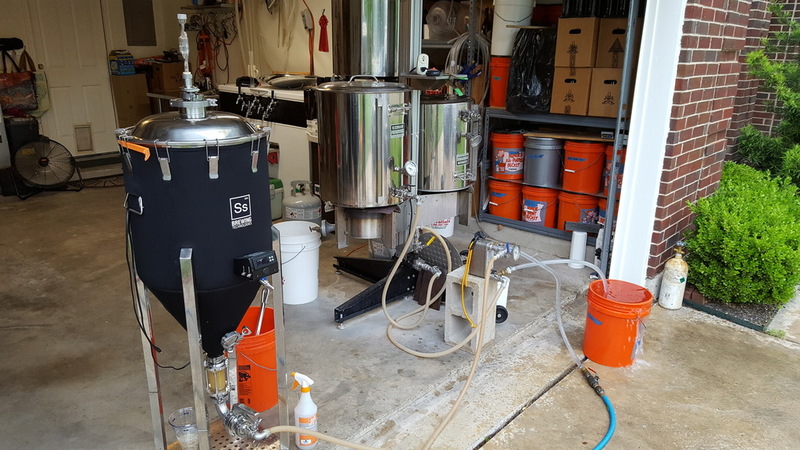 Here’s the next iteration, this time with a 60/40 split between regular T-90 pellets and pelletized CryoHops. I’ve about four of these under my belt and I’ve had mixed results. My first attempt was really a huge hit. My take was that it tended to be a little sweet for my tastes but was a crowd pleaser. The recipe was a bit heavy on the malt with a 50/50 2-row/Marris mix, and Honey malt. My efficiency was a bit high too so ended up north of seven percent ABV which isn’t bad, lots of NEIPAs are in that area; but I was hoping for something around six percent instead. 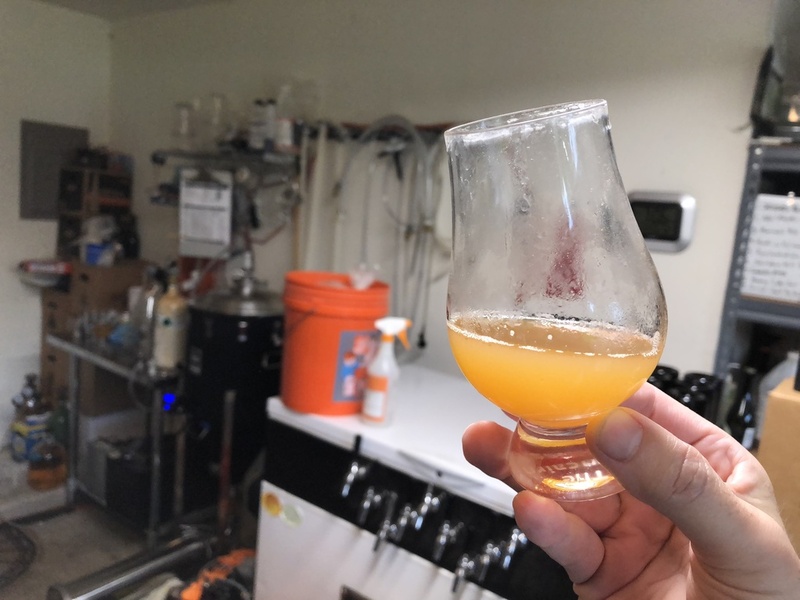 The second iteration modified the grain bill to match my Session IPA recipe but with modified hoping times and quantities to match the NEIPA style and I also tested out using a mixed-culture strain. When young, this one turned out very well but was a bit extreme with the grapefruit hop; so not as juicy as I would have liked. The Belgian phenols weren’t overly distracting but I prefer my NEIPAs with a clean yeast profile. 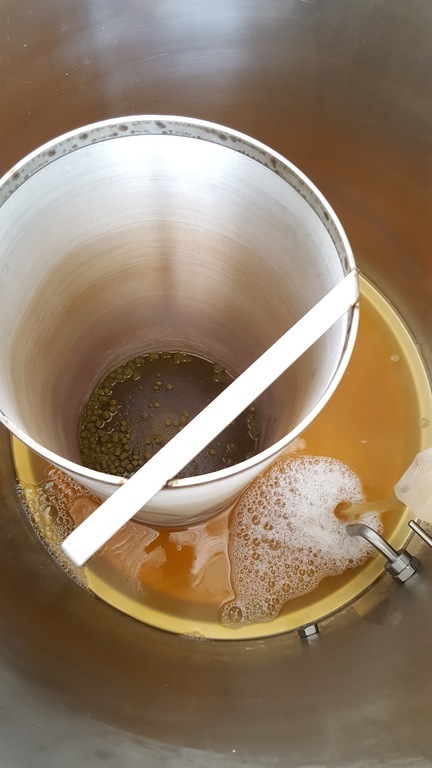 The third recipe resulted in even greater amount of hop bitterness; the exact opposite of what one wants with a NEIPA. And at this point I started looking at what might have gone wrong. Don’t use Cyrohops like regular hops where you might get IBUs. My first batch used zero Cryohops. I ended up getting some for my second batch, but I used them in the whirlpool/hopstand which greatly enhanced the aroma and flavors but I’m positive due to the high temp (flameout, no chilling) it certainly extracted alpha acids and more than I anticipated due to a long 30 minute hold. This embodies issues 1 through 4. The last issue I only recently read about as I was searching for why some of my lighter styles, witbier and pilsner seem to have been over the threshold that I would like in the particular style. It’s not entirely clear if there I’m actually seeing increased utilization in a 20 gallon boil for a 15 to 16 gallon batch, but I’m sure that in both of those recipes, version two will reduce the amount of hops I use but at least 10% if not 20. Thus, today I brewed a batch hoping to remedy all of these issues. Aptly named, Not Grapefruit Juice; which ultimately remains to be seen. The grain bill adds back in some of the Honey malt, it provides a nice background sweetness independent of the finishing gravity and doesn’t taste to my palette cloying. I’ve settled on roughly 50/50 flaked oats and white-wheat; the wheat gives a nice subtle toast and a touch of acidity to the base wort. Finally, I’ve added some Carapils for head retention. 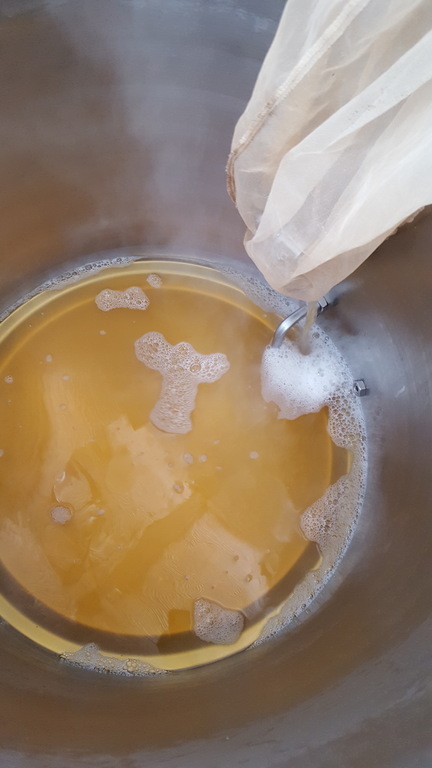 My previous batch attempted to address concerns over head retention through the elimination of use of Anti-Foamer, both in the starters and in the boil. The result showed no difference in additional head retention over other batches I’ve had. I’m super happy about that because taming both the 5L starter on the stove and the 20 gallon batch in the garage was intense. A couple drops of defoamer in the wort and I’m totally relaxed. Added 30 minutes to boil. Had extra gallon of wort. I can’t quite remember when but this hoppy pilsner, Real Ales’ Hans’ Pils somehow took over as my go-to beer on any night of the week. It has a mild malt sweetness tempered with a heavy dose of an herbal Nobel hop, Tettnanger. The rush of hops over the malt, peaking and then slowly fading for a long, dry finish is just fantastic. And here is the clencher; it’s so reasonably priced that it is now my benchmark. 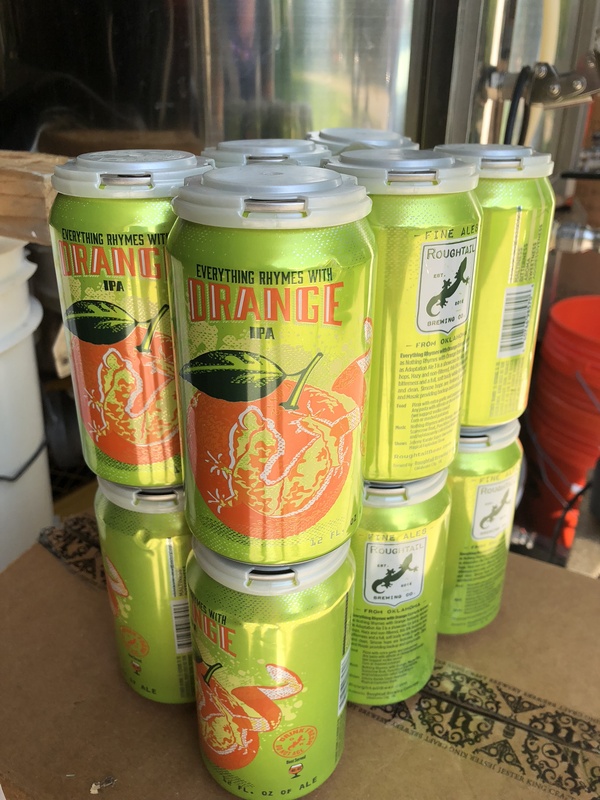 If I can get a 12-pack for a little over $1 a can; why would I pay double or triple that unless the beer is offering something new. 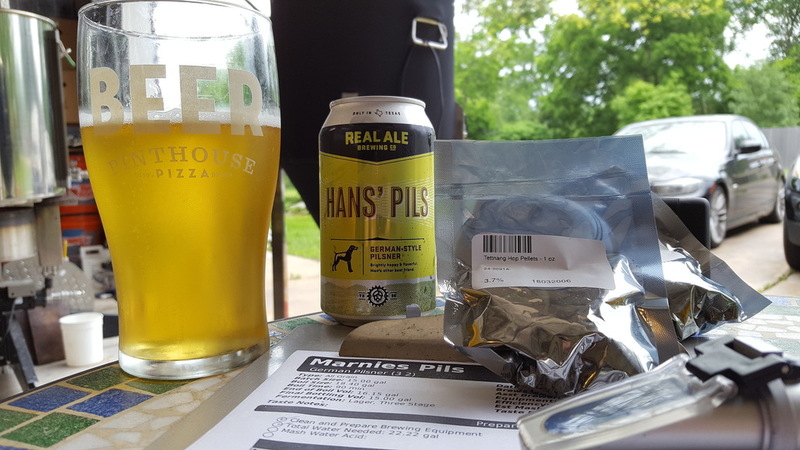 I’m not interested in replacing Hans Pils in my fridge; I’m pretty sure Real Ale is just going to keep knocking this one out consistently and I want to do my part to keep it coming, however I am interested in if some of my newer equipment and process won’t help me get pretty close to an excellent pilsner. To that end, I’ve pulled in a few new things for me. I’m giving the Brülosophy’s lager fermentation schedule a try. I always use a yeast starter, so that part isn’t new. But for this lager, I decided that I’d boost the pitch rate significantly. My favorite starter tool is over at Brewer’s Friend. 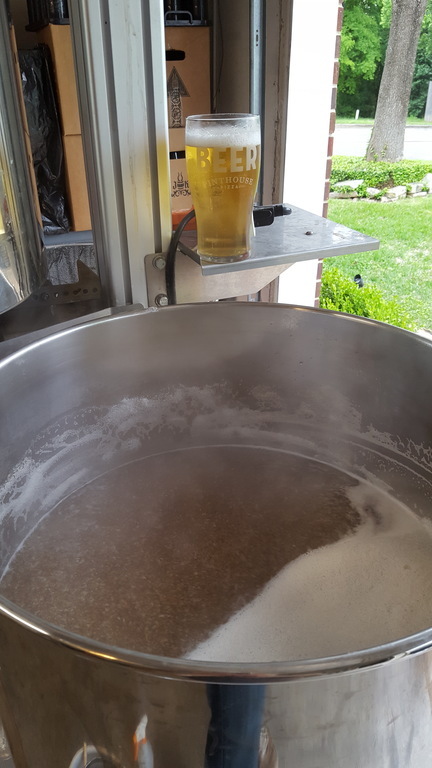 I selected the Pro-brewer lager rate, or 1.75 million cells per mL per degrees plato. What that meant was a two steps of 5L each, using 1lb of Dry Malt Extract each go. I hope that the extra effort to increase the amount of yeast when pitching will result in a super clean yeast profile. 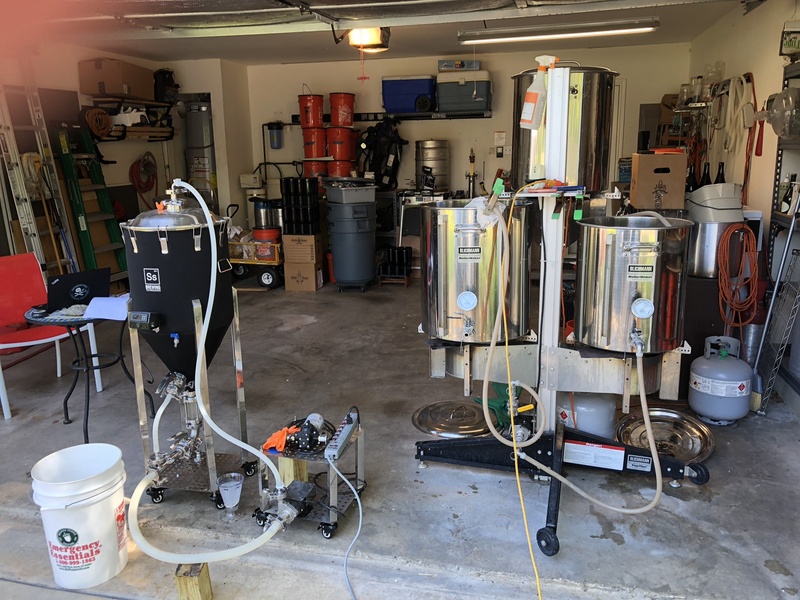 Here’s a walk through some of the brew day today. After an uneventful 75 minute mash at 148F, I’m sparging with 180F water into the mash tun; I had already recirculated the mash to raise the temp to 168F to stop conversion. 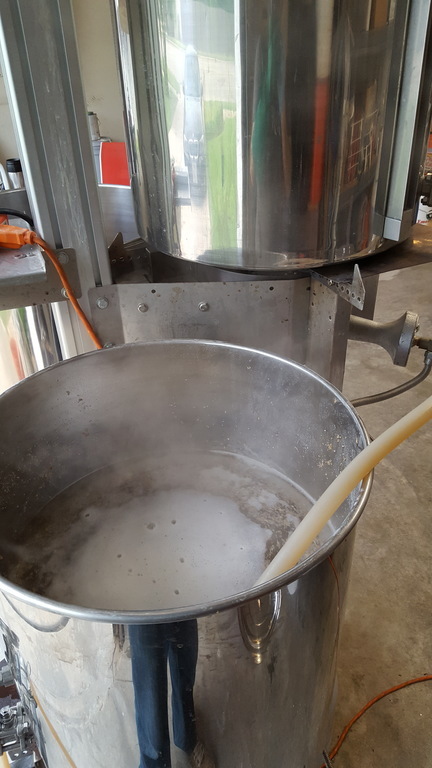 When I lauter, I usually go fairly fast; I’ve never really wanted to wait that long and my efficiency hasn’t been so low that I’m looking for ways to increase things. 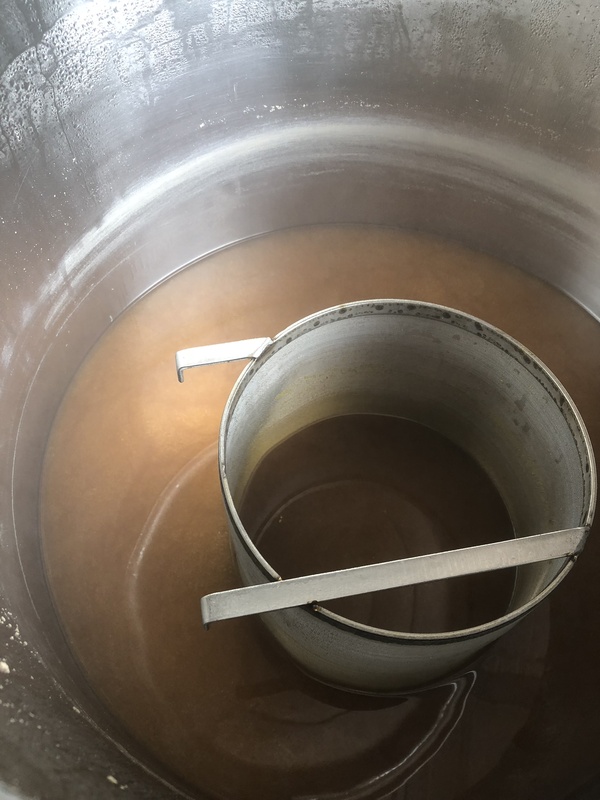 All pilsner malt comes into the boil kettle looking just perfect. I measure pre-boil gravity, usually with both a refractometer and my hydrometer for comparison. 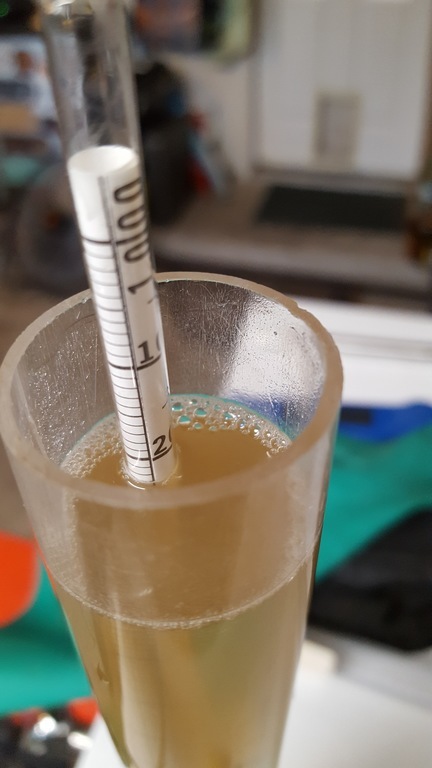 Today the hydrometer showed 1.047 S.G and the refractometer had 1.049 S.G. Good enough for me. 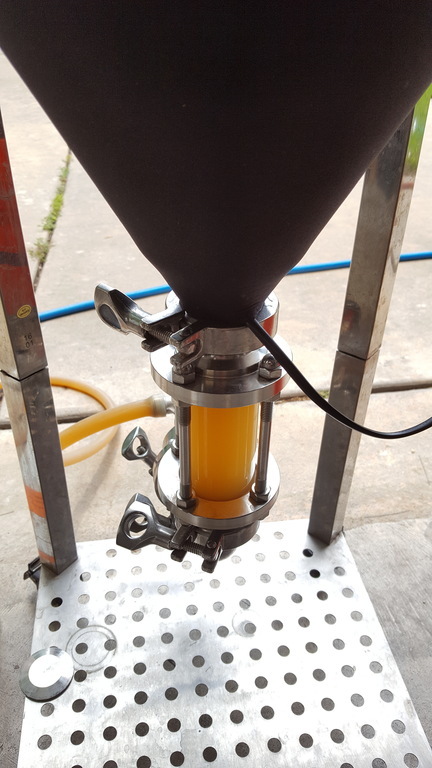 One other change for me was to skip the use of my silicone-based anti-foamer both in the yeast starters as well as the boil. I’m seeing if this has a meaniful effect of head retention once the beer is finished. That meant I did have to wrangle the hot break at the start of the boil when I normally don’t even have to look once. My favorite part of switching to a conical with glycol chiller is no longer having to recirculate ice water to get fermentation temperature. 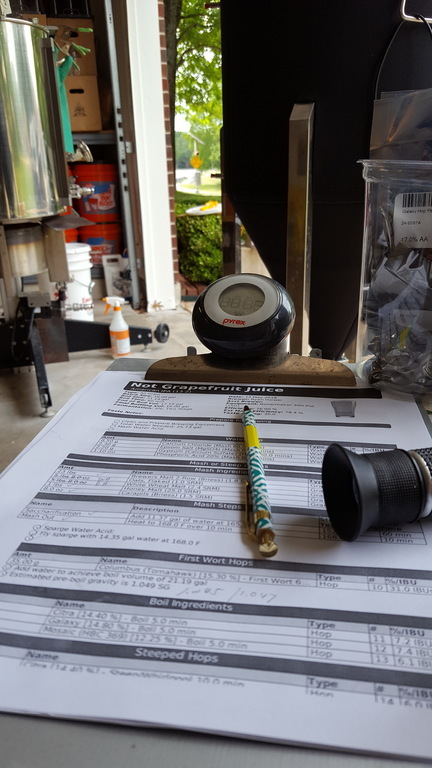 I just use ground water which gets me to 80F and then connect and start the glycol loop to bring it down to the target temperature. In this case, I’m pitching at 48F.